Manistee, Michigan has numerous activities to keep you busy, regardless of age. 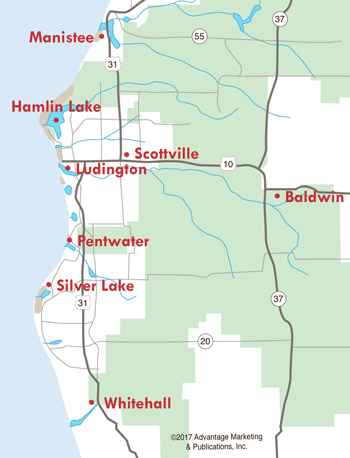 Visit our beaches, hike in the Manistee National Forest, try your luck at our casino, play a round of golf, tour our lighthouse, or enjoy the view on our Riverwalk. This is the city's largest recreational area, featuring playgrounds, tennis courts, picnic areas, volleyball and basketball courts, and softball field. Douglas Park also features a concession stand, public restrooms, and a pier which is great for fishing. This is East Lake Village's largest and most frequently used park, with 38 campground site, half with electrical hook-ups. There is also a bath house, boat launch and playground. Preserved as Manistee County's first historical museum, this building now houses logging, railroad and marina exhibits and memorabilia of Manistee in the Nineteenth Century. Open to the public only in July and August, Wednesday through Saturday, 12pm-4pm. However, the Manistee County Historical Museum at 425 River Street is open all year.